(U//FOUO) One of the most serious threats facing New Jersey and the entire U.S. Homeland continues to be that of the active shooter, regardless of motivation, who by the very nature of their associated tactics, techniques, and procedures, pose a serious challenge to security personnel based on their ability to operate independently, making them extremely difficult to detect and disrupt before conducting an attack. (U//FOUO) There have been numerous, recent examples of this threat nationally and internationally, including the active shooter incident this month at the Garden State Plaza Mall in Paramus (Bergen Co.), New Jersey which garnered national attention. The persistent nature of this threat and the expectation that it will continue to rank as the most likely scenario public safety officials will have to contend with in the foreseeable future, highlights the need for law enforcement and private sector security personnel to share information and best practices to better prevent and respond to similar, future incidents. 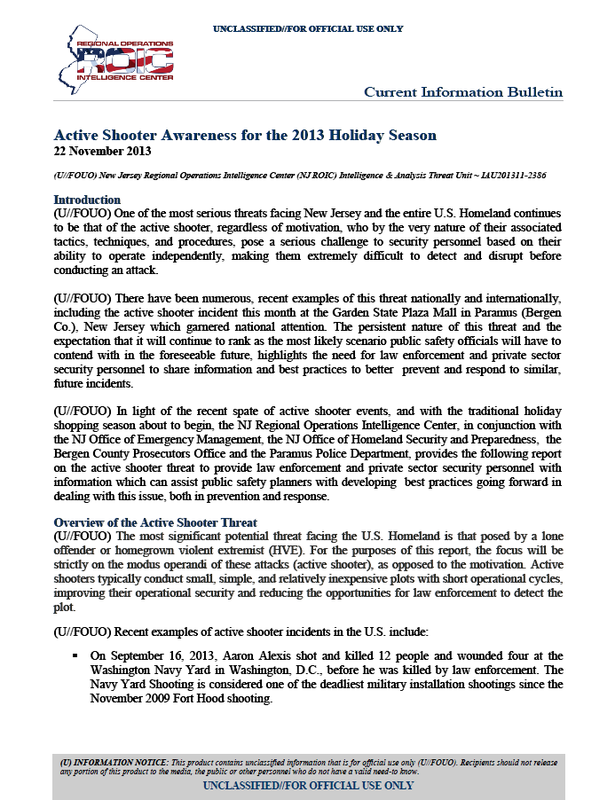 (U//FOUO) In light of the recent spate of active shooter events, and with the traditional holiday shopping season about to begin, the NJ Regional Operations Intelligence Center, in conjunction with the NJ Office of Emergency Management, the NJ Office of Homeland Security and Preparedness, the Bergen County Prosecutors Office and the Paramus Police Department, provides the following report on the active shooter threat to provide law enforcement and private sector security personnel with information which can assist public safety planners with developing best practices going forward in dealing with this issue, both in prevention and response. (U//FOUO) The most significant potential threat facing the U.S. Homeland is that posed by a lone offender or homegrown violent extremist (HVE). For the purposes of this report, the focus will be strictly on the modus operandi of these attacks (active shooter), as opposed to the motivation. Active shooters typically conduct small, simple, and relatively inexpensive plots with short operational cycles, improving their operational security and reducing the opportunities for law enforcement to detect the plot. On September 16, 2013, Aaron Alexis shot and killed 12 people and wounded four at the Washington Navy Yard in Washington, D.C., before he was killed by law enforcement. The Navy Yard Shooting is considered one of the deadliest military installation shootings since the November 2009 Fort Hood shooting. On November 1, 2013, a shooting occurred at the Los Angeles International Airport. Paul Anthony Ciancia, age 23, a former New Jersey resident, has been accused of killing a Transportation Security Administration officer and injuring several other people with a rifle. On November 4, 2013, Richard Shoop, age 20, entered the Garden State Plaza mall in Paramus, New Jersey, shortly before closing time wearing black clothing and a motorcycle helmet. He fired random shots with an automatic rifle in the mall before taking his own life. No one else was injured. (U//FOUO) Each indicator may be by itself, lawful conduct or behavior and may constitute the exercise of rights guaranteed by the U.S. Constitution. There also may be an innocent explanation for conduct that appears suspicious. For this reason, no single indicator should be the sole basis for law enforcement action. The totality of behavioral indicators and other relevant circumstances should be evaluated when considering any law enforcement response or action.